Anthony B. Robinson, Changing the Conversation: A Third Way for Congregations (Grand Rapids/Cambridge: Wm. B. Eerdmans, 2008), 199 pp; ISBN 978-0-8028-0759-5. 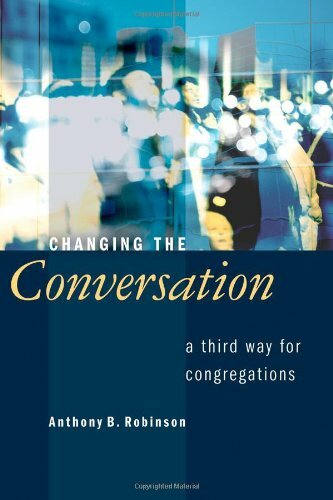 Changing the Conversation is a sequel to Anthony Robinson‘s most recent books Transforming Congregational Culture (2003) and What’s Theology Got to Do with It? Convictions, Vitality, and the Church (2006). It builds upon and complements work done by Diana Butler Bass, Darrell Guder, Michael Foss, Barbara Brown Taylor, Brian McLaren and others in their quest for the Church to find ‘a third way’ of being that moves beyond stereotyped polarities all-too-typical of its life and seeks a redefinition from a new centre which finds its pulse in its defining narrative – that is, in the divine economy. Robinson invites congregations to walk upon a way paved by the rediscovery of fresh language (which includes a rediscovery of ‘older words and concepts of the living tradition of our faith’ (p. 2)), the development of new conceptual frameworks, the formulation of new agendas and imaginings for being and doing church, and the fostering of new ways of framing both internal and external challenges and relations. Robinson (who has served as an ordained Minister of the United Church of Christ and has remained in touch with the realities of congregational life), understands that change is an inevitable and indispensable part of congregational life, that good leaders know and embrace this, and that a significant part of healthy change involves ceasing the typically dead-end conversations that congregations engage in, embracing reality accurately, and framing the challenges adequately. Drawing upon Ron Heifetz’s distinction between technical problems and adaptive challenges, and rehearsing Peter Drucker’s two simple questions – ‘What business are you in?’ and ‘How’s business?’ – this book identifies and is shaped around ten conversations that Robinson believes are requisite in order to initiate, deepen, sustain and grow congregational and denominational life. The opening chapter is concerned to map in broad outline some of the important historical and cultural shifts that have shaped, and been shaped by, the Church’s baptism of and in Christendom, and how the emergence of a post-Christendom North America is impacting historically mainline Protestant congregations and their ministry from one of chaplaincy to one of mission. One feature of Church that he believes will need to undergo a significant shift in both conceptuality and praxis concerns the role of pastors: ‘Instead of being chaplains to church and community, they will be congregational leaders and spiritual directors. They will not do most or all of their ministry on behalf of the larger church. They will support that ministry through preaching and teaching, mentoring and guiding’ (p. 29). William Stringfellow once observed, ‘These are harsh days for Protestants in America. American Protestants suffer the pathetic anxieties of a people once ascendant and reigning, but now defensive and in retreat’. How congregations might respond creatively (and in ways that move beyond lament and complaint, bewilderment and apathy) to the challenges and opportunities of this post-Christendom situation is the subject of Chapter Two. Rather than denying or bemoaning the sea change, Robinson asks if congregations might find a way to discern God at work among them and to respond by birthing new and more productive conversations and hopeful, engaged responses. He reminds us that ‘the word “Protestant” does not mean perpetual protest’ but rather derives from pro (‘for’) and testari (‘to testify). So, he asks, ‘what testimony do we offer about God and about God’s work in our midst?’ (p. 44). The third conversation, ‘A New Heart’, is an invitation to think about how the renewal of hearts and minds is at the centre of mainline Protestant congregations, is not reducible to a formula or recipe, and is always more important than any technique or program. In Chapter Four, Robinson turns to the issue of leadership, arguing that the work of leadership in the post-Christendom period is to assist congregations to face their own most important challenges and make progress on them. He defines pastoral leadership as ‘mobilizing a congregation … to engage its own most pressing problems and deepest challenges’ (p. 84). Part of the task of leadership (not necessarily of the ‘ordained’) is to read the context and congregation, to name and describe the challenges accurately, and to ‘remind a congregation (or other group) of its theologically and biblically informed purpose and core values. In other words, leadership should keep before the congregation the issues of “who are we?” (core values) and “why are we here?” (purpose)’ (pp. 85–6). Robinson observes that many congregations suffer a ‘leadership vacuum’, that instead of pastoral leaders and governing boards, they have chaplains and a group that is either ‘listening to endless reports or trying to micro-manage the operational administration of the congregation. The future’, he continues, ‘belongs to congregations that call and empower pastors who are leaders, and then also call and prepare governing boards that provide effective policy direction and leadership’ (p. 96). This directly raises the question of purpose, which is the concern of Chapter Five. The ‘Why are we here?’ question is, according to Robinson, always the most important question to begin with. He avers that congregations need reasonable clarity about their core purpose if they are to foster any new vitality and to shift, as Foss believes, from ‘a culture of membership to a culture of discipleship’ (p. 101). In making the important distinction between purpose and vision, Robinson, following C. Kirk Hadaway, contends that purpose is more important than vision, the former both precedes and shapes the latter: ‘Without a fairly clear sense of purpose, congregations can get caught up in the game of cultural catch-up or what’s newest and latest’ (p. 105). Robinson continues to labour this distinction and its logic of priority in chapters six to eight, drawing upon Heifetz’s notions on ‘adaptive challenges’. In Chapter Six, the concern is to explore the relationship between vision and purpose, on how congregations move from naming their raison d’être, to identifying the key challenges and then authoring a vision statement or strategic plan that serves their ministry. One vital emphasis here is that the work of the congregation does not fall to experts or authorities, nor to the pastor, or a consultant, or a small group designated to solve their problems for them. Rather, Robinson insists that ‘it is the people with the problem themselves, the people facing the challenge, who do the work. If the work is “discovering again God’s purpose (mission) for our church,” we can’t simply assign that to a mission committee’ (p. 122). While he acknowledges that most congregations face a combination of technical problems and adaptive challenges, to the extent that they understand those challenges as technical problems only, they will fail. Moreover, they would have ‘missed important, God-given opportunities to experience new hearts and minds’ (p. 123). Underlying the Christendom-era structures of church life are two notions: (1) the best way to involve people in Christian life and church participation is to get them serving on a board or committee of the church; and (2) the job of laity is to manage the church. If your church assumes that the best way to involve people in Christian life and the church is to get them on a board or committee, there’s a good chance that your congregation will have a lot of boards and committees to accommodate them. The result is often structures that are either Byzantine in complexity or Catch-22-like in absurdity. The second unhelpful assumption is that the really important job of lay Christians is to manage the church, its buildings, finances, property, and personnel. This effectively takes the team off the playing field and gives it the task of managing the clubhouse. Instead of inviting people to do ministry, current systems invite them to manage the ministry. You put these two assumptions together and let the whole thing settle for some decades, and the result would make for a good Monty Python skit … Could it be that the real job of dedicated Christians is not to manage the work of the ordained or the operational administration of the church facility, but to represent Christ to the world? I suspect that many would affirm this in theory, yet our church structures tend not to support the theory (pp. 137–8, 140). The eighth conversation attends to another arena of adaptive work facing mainline congregations; namely, public theology. It asks what shape and what voice the Church might embody in the public square in an age of redefined relations. ‘Death and Resurrection’ is the title of Chapter Nine. Here Robinson suggests that while, for some situations, congregational renewal is possible, sometimes a death – or something that looks and feels very much like death – is required before a resurrection is possible. The final conversation is a bit of a ‘Where to from now?’ chapter. Changing the Conversation will be read with profit by denominational staff, seminarians studying congregational life, and leaders of congregations. It offers a clear vocalization of some important theses and synthesises some valuable material on mission and vision. That said, some readers will want to question whether Robinson himself offers a decisive enough severing from the Christendom mindset that he is so properly concerned about. At the very least, the book’s pages frequently require some translation from a North American congregational context into other local dialects. Finally, how one assesses this book depends largely on whether one is seeking a handbook of tools or nutrition for a renewing of ecclesiological imagination. While there are indications that Robinson is seeking to offer both, it is more of the former rather than the latter that is to be found in this book.